If you are like many people, you like to celebrate! Why not?! Cheers! Sometimes, we can get caught up in our celebrations, and often drink just a little too much. Ouch! Sometimes, we can get caught up in our celebrations, and often drink just a little too much. Ouch! Nutritional Shake. Provides nutrition along with hydration to make you feel better sooner. Greens Powder. Helpful to alkalize your system and provides hydration when you mix with water. Antioxidants Stick. Provides recovery and protection for your body. In addition, we include easy health tips to help you while you recover, and some suggestions for the next time you plan to celebrate. 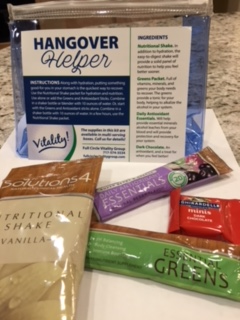 Plan ahead, and have a few Hangover Helper kits ready. Buy some as gifts – they’ll fit in a stocking. Use them as party favors. Email us or give us a call today. 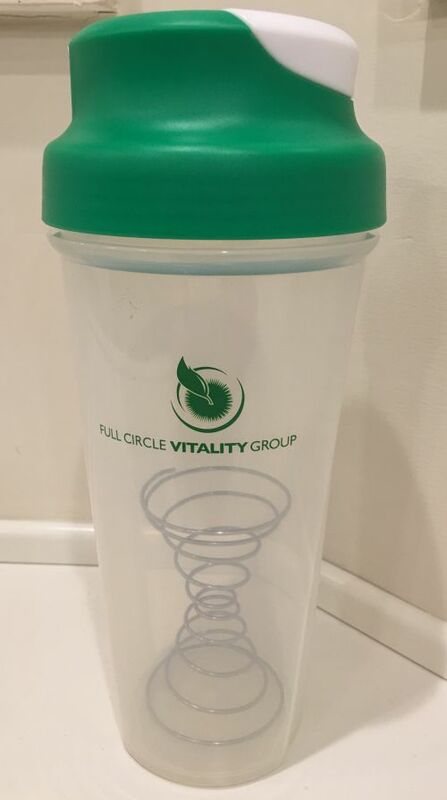 Full Circle Vitality Group carries really neat shaker bottles called Pogo Blenders. They have a convenient carabiner clip and an effective dual-action agitator so whatever you are blending comes out nice and smooth! These Pogos can make protein shakes, nutrition drinks, and even mix up scrambled eggs and mixes. They are perfect for those on-the-run times when you need a quick meal. You can get your very own bottle for only $12 each. If you are looking for a delicious and nutritious protein shake, check out our Solutions 4 products. The shakes come in four flavors: vanilla, chocolate, strawberry and orange. We will provide you with samples to try, too, if you aren’t sure about nutritional shakes. Full Circle Vitality Group utilizes Solutions4 products for clients who need supplemental nutrition or a quality nutritional shake. Solutions4 agrees with the idea that humans are inextricably and concurrently spiritual, physical, mental, and emotional beings, and that whatever affects a single aspect of one’s being will ultimately and in some measure affect all. These products are high quality and assist the body’s ability to renew and heal itself. Full Circle Vitality Group strives to provide a custom natural solution to clients’ nutritional needs to help them achieve their full vitality! Contact us today to order or for more information.